A brand new book has just been born! This book was put together and edited by Lynn Hudoba over at AutismArmyMom with initial help from her blogger buddy BigDaddyAutism. This book is a collection of articles written by over 40 bloggers who are parents of children with Special Needs. There's even an article in there from yours truly!! 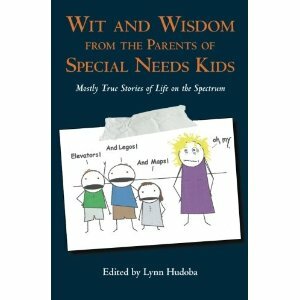 Wit and Wisdom From The Parents of Special Needs Kids brings together dozens of the best writers in the blogosphere, sharing their stories of both the challenges and rewards of raising children with autism and other cognitive disabilities. More than forty essays are included in this unique compilation,covering topics such as sensory issues, the difficulties of social interaction, the impact on marriage and typical siblings, and the world of special educationand therapies. These parents cover the gamut of experiences -- from initially receiving the diagnosis for their child and reconsidering their expectationsfor the future to learning how to let go of children as young adults – as well as an emotional spectrum from sadness and loss, to the frustrations of assimilating not-so-typical children into the typical world, to the joy of living amongsttheir often hilarious quirks and obsessions. Wit and Wisdom From The Parents of Special Needs Kids is a must read for anyone whose life has been affected by intellectual disabilities. Every parent of a special needs child will identify with the life experiencesincluded in this book -- they are as varied, unique, and inspiring as the children themselves. I look forward to getting my hands on my copy to see the wonderful stories that my fellow, very talented, blogger buddies have put forward. I feel honoured to be included. I may even be brave enough to read my own article! I am curious to be reminded of what I wrote... I think! Maybe you would like to buy a copy too? Or here if you're in Europe! Does this mean I'm a..... 'published author' now??!! That thought really settles my nerves! That's wonderful! You SHOULD be proud and oh so excited! You are definitely a published author - congratulations! What a fantastic idea for a book and if all the contributions are as good as your blog, it should be an entertaining and informative read. Well done! @Blue Sky: Thanks.... scary enough seeing it online! YAY!!! Now I have to go and get it!! !